We wanted to highlight as well as accentuate a clear path to the Great Pergola and also create the impression of a zen garden feeling in the Pagoda. Mr Timmerman had an existing Pagoda and a Shed and wanted to considerably reduce the amount of lawn in his backyard. Although a lawn serves useful functions such as backyard sports and an area for pets, they do come with a heavy price tag of both money and time. Lawns have to be mowed, fertilized, watered, weeded and treated for the occasional fungus, mold or disease. The client lived on acreage and already had more than enough land maintenance chores. He wanted to create an attractive, peaceful and most importantly low maintenance haven in his back yard where he can lounge and relax with his wife and their two dogs. We wanted to highlight as well as accentuate a clear path to the Great Pergola and also create the impression of a zen garden feeling in the Pagoda. We used beautiful black Texas Black Gravel underneath the Pergola and also for all the pathways to give a nice contrast to the surrounding river rock. 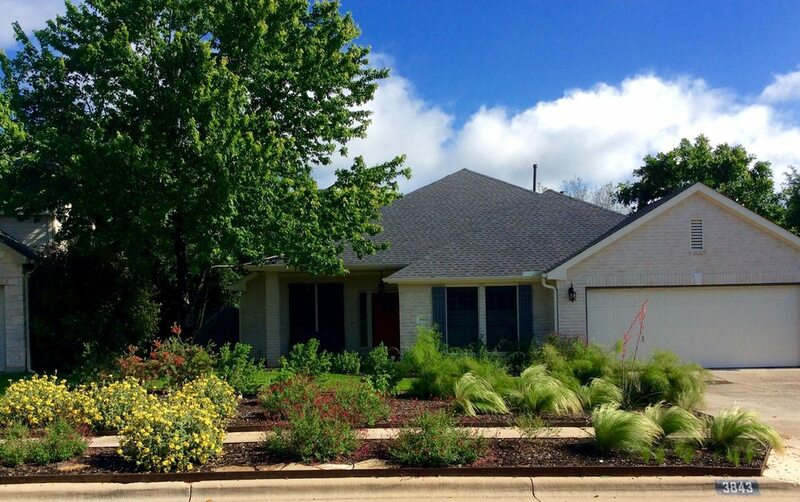 This being a classic Hill Country house, we used appropriate plants and design; Nice curvy lines, inviting meandering pathways and of course, lots of color! 226 Plants were used in total, among fifteen different plant varieties! We used more grassy, desert themed plants in the front. In the back of the Pergola we picked a few trees to create a nice frame for the more colorful and dramatic plant arrangement. Unique Retama Trees were used in combination with the classic Texas Mountain Laurel trees in the back. Dramatic color was provided by plantings of Pride Of Barbados with Mexican Bush Sage. Jerusalem Sage and Cherry Sage provided the last finishing touches. The client was very happy with the final result. Plants took off and the result is phenomenal and very easy to maintain.